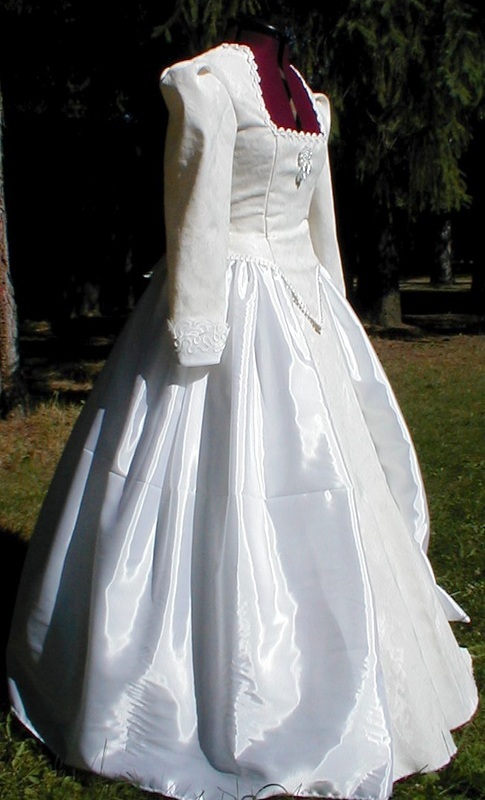 The Mary, Queen of Scots wedding dress is a gorgeous design which flatters the body and provides a regal setting for your wedding day. Queen Mary was quite fond of the color white, and wore it often. In her honor, we are pleased to offer you the style of dress that was popular during her reign. The long, fitted white brocade bodice laces in the back, and features delicate trim along the neckline and waist, with a pearl cluster in the center. The bodice is fully lined and boned for support. 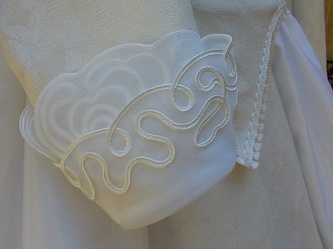 The full sleeves taper into slim, lace trimmed wrists. The separate white satin skirt features a drawstring waist with a brocade forepart, and is full enough to accommodate very large hoopskirts. We suggest ordering your dress a minimum of 3 months prior to your event. Please contact us to place you order! 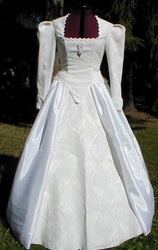 For $100 more, we will make this gown based on the measurements you provide. This is ideal if you have a unique figure or just want a more personalized fit. While some basic alterations may still be required, they should be kept to a minimum.